Life is an adventure. It should be enjoyed. You should make your life memorable by doing challenging things every now and then. Make a list of things you must do before you die. Make sure to add camping in that list as well. Camping is one great way to enjoy the world and the life that is gifted to you. The fear of being in the middle of a dark nowhere while suddenly it starts to pour heavily and you have no fire; that is the kind of fun that can never be explained but can only be experienced. It is true that there is a risky side to it. You could fall sick, it could get extremely cold and what not. But that is what life is about, isn’t it? Take risks, live through them and collect hundreds of stories to share with the people. However, to make sure that you come out alive and healthy from these risks, you must take precautions. Today, we’ll give you the best tips on how to stay warm in a tent. By following these guidelines, you’ll get a cozy and relaxed living space so that you can enjoy the rest of the challenge with full energy. 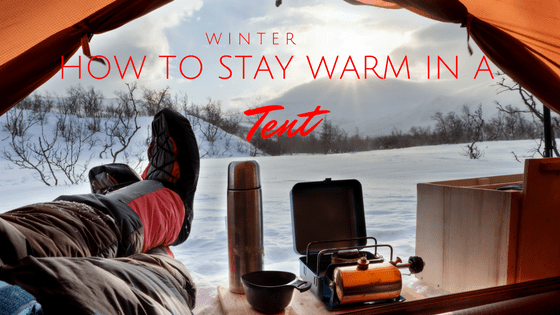 The simplest formula of how to stay warm in a tent is to prevent yourself from getting cold. Sounds pretty dumb but if you look at it practically, it is very helpful. Dress up warm, layer yourself up in winter survival clothing layers and try not to let your body lose its temperature. When the surroundings will be cold, your body will take up a lot of time to regain lost heat. Therefore, try your best to keep the cool out of your layers of clothing. This way, you won’t be in trouble even if you lose your fire. Secondly, stay dry. Once you or your clothes or the space you’re living in gets wet, it will get very extremely cold, too. Keep a stack of dry clothes readily available. If you feel like any part of the clothes has gotten wet, immediately change into dry clothes to prevent from getting further cold. This way your sleeping space will stay warmer as well. There is certain science that applies to the temperature of an area. For example, we all know that hot air rises and cool air sinks. Of course, this way, the lower parts of any area will be cold. Similarly, the tunnel-like area in between valleys is going to be extra chilly too. On the contrary, you don’t want to camp on a high cliff either. Although hot air rises, that doesn’t mean that high spots will be always warm. They are also potential spots for chilly winds as well as for dangerous storms. Research your campsite thoroughly. Find out where the temperature would scientifically be more bearable. That is how to stay warm in a tent in the chilly weather. You can make your sleeping space cozy for getting warmer easily. When you’re worried about how to stay warm in a tent, you should purchase an insulated sleeping bag that is cold weather rated. Other than that, you can use double sleeping bags. Put one inside the other so that you have two layers around you. Next, you can add a blanket or a mattress underneath the sleeping bag. Not only will all of this make your sleeping bag extremely relaxing, it will minimize entrance of chilly air. Also, all of this allows the space to get warmer quicker. You don’t want to be in direct contact with the cold ground. Therefore, add in as many layers as you possibly can to prevent the cold from the ground to reach you. You may opt for a camping bed or cot which is raised from the floor instead of a sleeping bag for this matter. Our best suggestion for how to stay warm in a tent is to carry a fleece blanket with you on your camping trip. Also, make sure that you keep your sleeping bag in a good place when it’s not in use. You don’t want it to accumulate moisture while you’re out of it. While it is true that you must stay covered and layered in order to stay warm in a tent, it is also necessary to dress in breathable clothes. You don’t want to completely wrap up your body with no breathing spots. The body will feel the need to sweat in this case. It is a well-known fact that sweating is a natural process used to lower body temperature. If that starts happening, you’ll end up getting colder instead of feeling warm inside layered, warm clothes. You need to be very intelligent in this case. You must be wrapped enough to prevent cold air striking your body but they must be breathable clothes too. If you’re thinking how to stay warm in a tent in breathable clothes, among good options are merino wool or fleece clothes. They aren’t too tight to the skin but they are warm. Socks, scarves, and hats are a must. Do not forget your gloves either unless if you want to get your hands numb! Be appropriately dressed throughout the day. How you feel the entire day will determine the kind of sleep you get at night. If you were chilly the entire day, you’re likely to have a harder time getting warm at night. The simple answer of how to stay warm in a tent at bedtime is to stay warm throughout the day. What you eat before bed will have a great effect on the kind of sleep you get. You don’t want to be sipping ice-cold drinks. Have warm dinner and drink warm liquids too. The intake of warm fluids will instantly increase your body temperature. Consume a good amount of food. Stay high on fats and carbohydrates so that your body can burn them to create heat. Drink soups. They are easy to carry, they are easy to cook and they offer a nutritional balance as well. They will also keep you warm in a tent. If there is one thing you cannot afford to forget to pack on a winter camping trip, it is an insulated hot water bottle. To be honest, it will be a lifesaver. Your worries about how to get warm in a tent will vanish. Although we’re recommending all these tips to stay warm, there is a chance you may still be cold before bed. At that time, you’ll realize that everything is failing to warm you up. That is when you’ll have to get up to warm some water and put it in a hot water bottle. Carry it with you to your sleeping space. Put it in cold spots. For example, if your feet feel very cold, place the hot water bottle near your feet and lay down. It will work like magic and your chilly feet will warm up very soon. Another tip on how to stay warm in a tent is to help generate body heat instantly to make your body hyper. Jump up and down, do some exercise, try push-ups and squats, make your body move and that will heat you up. Just do enough exercise to make your blood rush, but don’t get to the point where you start sweating. As mentioned before, sweating will naturally lower your body temperature and you do not want that to happen at all. Work out for a couple of minutes and then zip yourself up in the sleeping bag. When we talked about having a good dinner, we mentioned that fact that high fat and carbohydrate foods are important so that they are burnt to produce body heat. Keep in mind that food digestion requires water. People easily get dehydrated in winter since they don’t intake enough amounts of water regularly. Throughout the day, keep this in mind. Stay hydrated and consume enough water. Once again, like with everything else, you don’t want to go extra. Don’t drink way too much or you’ll have to ruin your warm sleep for bathroom breaks in the middle of the night. This is a really genius tip for how to get warm in a tent. What you have to do is decide your outfit for the next day before you go to sleep. While you’re zipping yourself in the sleeping bag at night, add in the outfit of the next day too. Not only will it work as an extra layer between you and the cold floor, it will also make the clothes warm overnight. When you wake up the next day, you wouldn’t have to dread getting into cold clothes. Neither will you have to worry again about how to stay warm in a tent. Campfires are a great way to warm up. The issue is that not all campsites allow it. That is when we get to make use of technology. Most campsites have an electrical supply available. You can make use of that to plug-in an electric heater in your camping spot. Make sure you don’t leave the heater unattended. Camping tents aren’t very well ventilated. There is a risk of things catching fire. Therefore, if you opt for this option, be very careful. 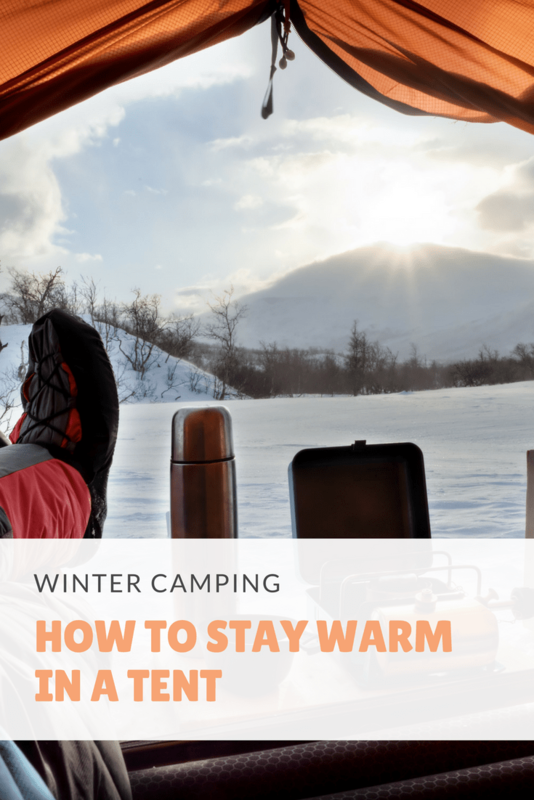 Here you have the best ways for how to stay warm in a tent even if you’re camping in a chilly weather. Now that this issue is out of the way, book your camping trip right away and enjoy your vacations with a touch of risk this time!